Donald Henry Pleasence OBE (/ˈplɛzəns/; 5 October 1919 – 2 February 1995) was an English actor. 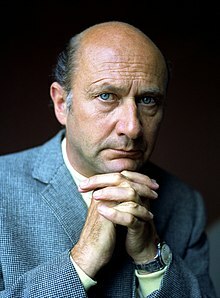 His best known film roles include psychiatrist Dr. Samuel Loomis in Halloween (1978) and four of its sequels, the villain Ernst Stavro Blofeld in the James Bond film You Only Live Twice (1967), RAF Flight Lieutenant Colin Blythe in The Great Escape (1963), SEN 5241 in THX 1138 (1971), Clarence "Doc" Tydon in Wake in Fright (1971), and the President of the United States in Escape from New York (1981). Pleasence was born in Worksop, Nottinghamshire, England, the son of Alice (née, Armitage) and Thomas Stanley Pleasence, a railway stationmaster. He was brought up as a strict Methodist in the small village of Grimoldby, Lincolnshire. He received his formal education at Crosby Junior School, Scunthorpe and Ecclesfield Grammar School, in Sheffield, South Yorkshire. After working as the Clerk-in-Charge at Swinton railway station in South Yorkshire, he decided that he wanted to be a professional actor, taking up a placement with the Jersey Repertory Company in 1939. In December 1939, Pleasence initially refused conscription into the British Armed Forces, registering as a conscientious objector, but changed his stance in autumn 1940, after the attacks upon London by the Luftwaffe, and volunteered with the Royal Air Force. He served as aircraft wireless-operator with No. 166 Squadron in Bomber Command, with which he flew almost sixty raids against the Axis over occupied Europe. On 31 August 1944, Lancaster NE112, in which he was a crew member, was shot down during an attack upon Agenville, and he was captured and imprisoned in the German prisoner-of-war camp Stalag Luft I, where he was treated well reciprocally (like the British treated captured Luftwaffe pilots) in similar prisoner-of-war camps. Here, Pleasence produced and acted in many plays for the entertainment of his fellow captives. After the war and his release, he was discharged from the R.A.F. in 1946. 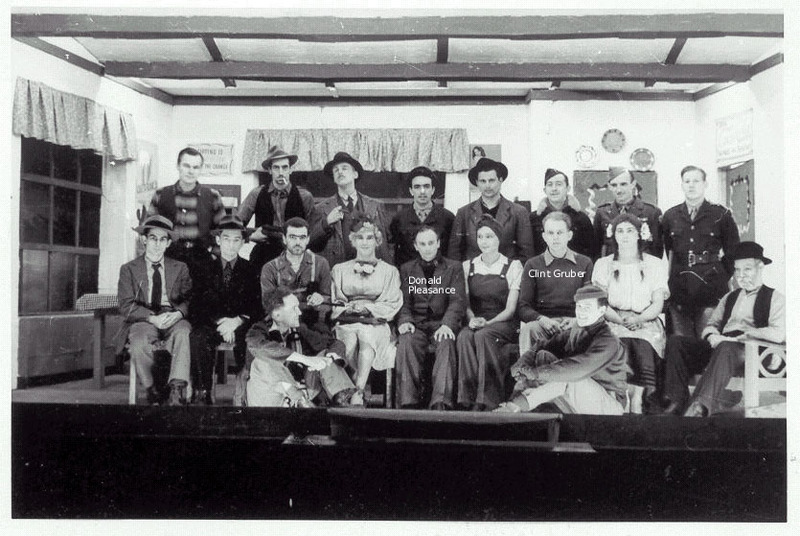 Returning to acting after the war, Pleasence resumed working in repertory theatre companies in Birmingham and Bristol. In the 1950s, Pleasence's stage work included performing as Willie Mossop in a 1952 production of Hobson's Choice at the Arts Theatre, London and as Dauphin in Jean Anouilh's The Lark (1956). In 1960, Pleasence gained excellent notices as the tramp in Harold Pinter's The Caretaker at the Arts Theatre, a role he would again play in a 1990 revival. Other stage work in the 1960s included Anouilh's Poor Bitos (1967) and Robert Shaw's The Man in the Glass Booth (1967), for which he won the London Variety Award for Stage Actor of the Year in 1968. Pleasence's later stage work included performing in a double bill of Pinter plays, The Basement and Tea Party, at the Duchess Theatre in 1970. Pleasence made his television debut in I Want to Be a Doctor (1946). He received positive critical attention for his role as Syme in the BBC version of Nineteen Eighty-Four (1954) from the novel by George Orwell. The adaptation was by Nigel Kneale and featured Peter Cushing in the lead role of Winston Smith. Pleasence played Prince John in several episodes of the ITV series The Adventures of Robin Hood (1956–1958). He appeared twice with Patrick McGoohan in the British spy series, Danger Man, in episodes "Position of Trust" (1960) and "Find and Return" (1961). Pleasence's first appearance in America was in an episode of The Twilight Zone, playing an aging teacher at a boys' school in the episode "The Changing of the Guard" (1962). In 1963, he appeared in an episode of The Outer Limits entitled "The Man With the Power". In 1966, he also guest starred in an episode of The Fugitive entitled "With Strings Attached"
In 1973, Pleasence played a sympathetic murderer in an episode of Columbo entitled "Any Old Port in a Storm". Also that year, he played a supporting role in David Winters' musical television adaptation of Dr. Jekyll and Mr. Hyde. He also portrayed a murderer captured by Mrs. Columbo in "Murder Is a Parlor Game" (1979). In 1978, he played a scout, Sam Purchas in an adaptation of James A. Michener's Centennial. Pleasence starred as the Reverend Septimus Harding in the BBC's TV series The Barchester Chronicles (1982). In this series, his daughter Angela Pleasence played his onscreen daughter Susan. He hosted the 1981 Halloween episode of Saturday Night Live with music guest Fear. In 1986, Pleasence joined Ronald Lacey and Polly Jo Pleasence for the television thriller Into the Darkness. Donald Pleasence in the trailer for the film Eye of the Devil (1966). Pleasence made his big-screen debut with The Beachcomber (1954). Some notable early roles include Parsons in 1984 (1956), and minor roles opposite Alec Guinness in Barnacle Bill (1957) and Dirk Bogarde in The Wind Cannot Read (1958). In Tony Richardson's film of Look Back in Anger (1959), he plays a vindictive market inspector opposite Richard Burton. In the same year, Pleasence starred in the horror films Circus of Horrors directed by Sidney Hayers, playing the role of Vanet, the owner of a circus, and The Flesh and the Fiends as the real-life murderer William Hare, alongside Peter Cushing, George Rose and Billie Whitelaw. Endowed with a bald head, a penetrating stare, and an intense voice, usually quiet but capable of a piercing scream, he specialised in portraying insane, fanatical, or evil characters, including the title role in Dr Crippen (1962), the double agent Dr Michaels in the science-fiction film Fantastic Voyage (1966), the white trader who sells guns to the Cheyenne Indians in the revisionist western Soldier Blue (1970), the mad Doctor in the Bud Spencer–Terence Hill film Watch Out, We're Mad! (1974), Nazi leader Heinrich Himmler in The Eagle Has Landed (1976), and the Bond arch-villain Ernst Stavro Blofeld in You Only Live Twice (1967), the first film in which Blofeld's face is clearly seen. His interpretation of the character has become predominant in popular culture considering the popularity of the comic villain, Dr. Evil in the successful Austin Powers film series, which primarily parodies it. In the crime drama Hell is a City (1960), shot in Manchester, he starred opposite Stanley Baker, whilst he was memorably cast in the horror comedy What a Carve Up! (1961) as the “horrible-looking zombie” solicitor opposite Shirley Eaton, Sid James, Kenneth Connor and Dennis Price. He appeared as the mild-mannered and good-natured POW forger Colin Blythe in the film The Great Escape (1963), who discovers that he is slowly going blind, but nonetheless participates in the mass break-out, only to be shot down by German soldiers because he is unable to see them. In The Night of the Generals (1967), he played another uncharacteristically sympathetic role, this time as an old-school German general involved in a plot to kill Adolf Hitler. In 1971, he returned to the realm of the deranged, delivering a tour de force performance in the role of an alcoholic Australian doctor in Ted Kotcheff's nightmarish outback drama Wake in Fright. Pleasence played Lucifer in the religious epic The Greatest Story Ever Told (1965). His character taking on many dark, shadowy human disguises throughout the film was unprecedented in breathing life into the Luke 4:13 phrase "... he left Him until an opportune time ..." He was one of many stars who were given cameos throughout the film. He also acted in Roman Polanski's Cul-de-sac (1966), in which he portrayed the love-sodden husband of a much younger French wife (Françoise Dorléac). He ventured successfully into American cowboy territory, playing a sadistic self-styled preacher who goes after stoic Charlton Heston in the Western Will Penny (1968). He portrayed SEN 5241 in THX 1138 (1971), opposite Robert Duvall which was the directorial debut of George Lucas. Few heads later years, he portrayed Lucas Deranian in Walt Disney's Escape to Witch Mountain (1975), and the Russian seeking to start a war between the United States and the Soviet Union in Telefon (1977). Pleasence appeared as Dr. Samuel Loomis in John Carpenter's horror film Halloween (1978). The film was a major success and was considered the highest grossing independent film of its time, earning accolades as a classic horror film. He also played the teacher, Kantorek in All Quiet on the Western Front (1979), Dr. Kobras in The Pumaman (1980) and the held-hostage President of the United States in Escape from New York (1981). The rather sinister accent which Pleasence employed in this and other films may be credited to the elocution lessons he had as a child. He reprised his Dr. Sam Loomis role in Halloween II (1981), Halloween 4: The Return of Michael Myers (1988), Halloween 5: The Revenge of Michael Myers (1989) and Halloween: The Curse of Michael Myers (1995). Pleasence admired Sir Laurence Olivier, with whom he worked on-stage in the 1950s, and later on the film version of Dracula (1979). Two years earlier, Pleasence did an amusingly broad impersonation of Olivier in the guise of a horror-film actor called "Valentine De'ath" in the film The Uncanny (1977). According to the film critic Kim Newman on a DVD commentary for Halloween II, the reason for Pleasence’s lengthy filmography was that he never turned down any role that was offered. During the early 1960s, Pleasence recorded several children's-story records on the Atlas Record label. These were marketed as the Talespinners series in the United Kingdom. They were also released in the United States as Tale Spinners for Children by United Artists. The stories included Don Quixote and the Brave Little Tailor. Pleasence provided the voice-over for the British public information film, The Spirit of Dark and Lonely Water (1973). The film, intended to warn children of the dangers of playing near water, attained notoriety for allegedly giving children nightmares. Pleasence was the author of the children's book Scouse the Mouse (1977) (London: New English Library), which was animated by Canadian animator/film director Gerald Potterton (a friend of the actor, who directed him in the Canadian film The Rainbow Boys (1973), retitled The Rainbow Gang for VHS release in the United States) and also adapted into a children's recording (Polydor Records, 1977) with Ringo Starr voicing the book's title character, Scouse the Mouse. In his book British Film Character Actors (1982), Terence Pettigrew describes Pleasence as "a potent combination of eyes and voice. The eyes are mournful but they can also be sinister or seedy or just plain nutty. He has the kind of piercing stare which lifts enamel off saucepans." Pleasence was nominated four times for the Tony Award for best performance by a leading actor in a Broadway play: in 1962 for Harold Pinter's The Caretaker, in 1965 for Jean Anouilh's Poor Bitos, in 1969 for Robert Shaw's The Man in the Glass Booth, and in 1972 for Simon Gray's Wise Child. Pleasence was appointed an Officer of the Most Excellent Order of the British Empire for his services to the acting profession by Queen Elizabeth II in 1994. On 2 February 1995, Pleasence died at age 75 in Saint-Paul-de-Vence, France, from complications of heart failure following heart valve replacement surgery. His body was cremated. The 1995 film Halloween: The Curse of Michael Myers was dedicated to Donald Pleasence. The 1998 film Halloween H20: 20 Years Later also features a dedication to Pleasence in the end credits, with sound-alike voice actor Tom Kane providing a voice-over for Loomis in the film. In the 2018 film, Halloween, sound-alike comedian Colin Mahan voiced Loomis. Dr. Evil, the character played by Mike Myers in the Austin Powers comedy films (1997–2002), and Doctor Claw from Inspector Gadget are parodies of Pleasence's performance as Blofeld in You Only Live Twice. 1963 The Great Escape RAF Flt. Lt. Colin Blythe, "The Forger"
1977 The Uncanny Valentine De'ath Segment: "Hollywood 1936"
1980 Halloween: Extended Edition Dr. Sam Loomis Appeared in additional footage (filmed during the production of Halloween II) not included in the original film but featured in the NBC television broadcast. 1995 Halloween: The Curse of Michael Myers Dr. Samuel Loomis The film was dedicated to his memory. 1955 The Grove Family Monsieur Paul Episode: "Parlez-Vous Français?" 1957 Assignment Foreign Legion Commandant Episode: "The Coward"
1959 The Killing Stones Jakob Kleiber Episode: "The Carefulness of Kleiber"
1959 The Adventures of William Tell The Spider Episode: "The Spider"
1960 The Four Just Men Paul Koster Episode: "The Survivor"
1960 Interpol Calling Karl Haussman Episode: "The Absent Assassin"
1960 Rendezvous Potter Episode: "The Dodo"
1960–1965 Armchair Mystery Theatre Host / Ambrose Acted in episode: "Ambrose"
1961 Alcoa Presents: One Step Beyond Harvey Laurence Episode: "The Confession"
1961 Walt Disney's Wonderful World of Color Captain Pinski Episode: "The Horsemasters"
1962 The Twilight Zone Professor Ellis Fowler Episode: "The Changing of the Guard"
1963 The Outer Limits Professor Harold Finley Episode: "The Man with the Power"
1964 Espionage Escalon Episode: "The Liberators"
1965 The Defenders Dr. Byron Saul Episode: "Fires of the Mind"
1966 The Fugitive Max Pfeiffer Episode: "With Strings Attached"
1971 The Rivals of Sherlock Holmes Carnacki Episode: "The Horse of the Invisible"
1972 Hawaii Five-O Hans Vogler Episode: "The Ninety-Second War: Part II"
1972 The Man Outside Victor Cobb Episode: "A Glass of Snake Wine"
1972 Police Surgeon Jerry Hahn Episode: "Lady X"
1973 Columbo Adrian Carsini Episode: "Any Old Port in a Storm"
1973 Orson Welles' Great Mysteries Cawser Episode: "Captain Rogers"
1975 Shades of Greene Puckler Episode: "The Root of All Evil"
1976 Peep Show Max Episode: "Death"
1976 Laurence Olivier Presents Nat Jeffcote Episode: "Hindle Wakes"
1979 Mrs. Columbo Ian A. Morly Episode: "Murder Is a Parlor Game"
1981 Saturday Night Live Host Episode: "Donald Pleasence/Fear"
1987 Basements Mr. Kidd Television film; segment: "The Room"
1988 The Ray Bradbury Theater George Hill Episode: "Punishment Without Crime"
1992 Lovejoy Karel Redl Episode: "The Prague Sun"
1993 Screen Two Victor Harty Episode: "Femme Fatale"
^ "England and Wales Births 1837–1983". Freebmd.org.uk. 10 September 2010. Retrieved 6 October 2010. ^ Ross, Helen; Ross, Lillian (1962). The Player: A Profile of an Art. Simon and Schuster. p. 256. ISBN. ^ a b "Full text of "The Player A Profile Of An Art"". Archive.org. Retrieved 6 October 2010. ^ Obituary for Pleasence, 'The Independent', 2 February 1995. ^ Obituary for D. Pleasence, 'The Independent', 3 February 1995. ^ a b c d e f g "Obituaries: Donald Pleasence". The Independent. 3 February 1995. Retrieved 14 February 2012. ^ "Circus of Horrors". Turner Classic Movies. Retrieved 9 November 2015. ^ "Donald Pleasence'S Biography". Pleasence.com. Retrieved 6 October 2010. ^ "Dr. Loomis Has a Voice Cameo in Halloween 2018". 27 July 2018. ^ "New 'Halloween' almost had a completely different beginning". EW.com. Retrieved 21 October 2018.